It appears that VMI is approximately as significant as is Home Field Advantage in predicting the team performance for today's game; therefore, if you have Home advantage in your formulas as 10%; then, you should give VMI a similar weighting. If you are predicting a player's individual performance, then VMI is approximately 20% in my observation. Since, we have only a few years of actual data, then these percentages will be refined over the course of the next several years. 0.00 to 2.99 = 52% for a weighting suggestion of approximately 2% - 4% in your formula. In this range, the extra movement is less a concern than is focus. 3.00 to 6.99 = 56% for a weighting suggestion of approximately 4% - 6% in your formula. In this range focus could easily overcome extra movement. 7.00 to 14.99 = 65% for a weighting suggestion of approximately 10% - 20% in your formula. In this range the pitcher is unaware, so may play into the hitter's strength. 15.00 & Above = 65% for a weighting suggestion of approximately 10% - 20% in your formula. In this range, the pitcher may not have a good scouting report, plus the movement is either substantially more or less than his norm, so it will affect his precision. We track humidity, temperature and air resistance factors for all Major League Games. Since air resistance dictates how much movement, curve, hop and bend that a pitcher has available to him on that particular day, then we can predict several things about the hitter facing a pitcher and several things about a pitcher as he faces particular hitters. We use an index to show how the air resistance affected each game and then convert the information to help predict future performance. Over 40 years of study, participation and observation have united to form an understanding of what creates additional movement for a pitcher and the instincts required to adjust to hitting the variations of major league fastballs squarely. The index produced will tell you, the player, coach, or fantasy player what factors are likely to affect today's or tomorrow's game. 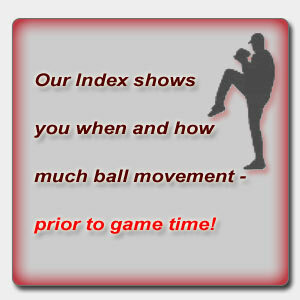 As you get familiar with the index, you will be able to predict a player's level of effectiveness, based on the severity of the index. A higher negative index will mean that the hitter will struggle more than normal, to make good contact, particularly in the higher speed ranges (fastballs, sinkers, cutters, etc.) due to additional movement on each type of pitch. A lower negative index will mean it is possible for the hitter to focus more on the small amount of movement and be successful. A hi gher positive index will mean the opposite. The hitter will see less movement, curve, hop and bend than he normally sees at this speed, therefore will be prone to making better contact. A lower positive index may be indicative of the player becoming lulled into lack of focus. 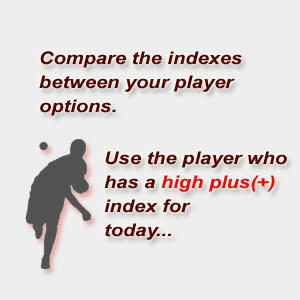 The players from each team all play within the same environment daily throughout the season, therefore the player's index will be the same as the team's index until he may be traded. You can compare last year's performance for some of your team members to that day's index by going to "Team VMI's" and selecting a date of a particular game during previous Fantasy Baseball seasons. The index of the team he actually plays for, will be the index displayed prior to that game and will be your team member's index. You can then see whether you should have played him for not, based on his index. In this way you can judge the effectiveness of the index. The index for each game will be displayed a day prior to the game for the Fantasy Baseball season.